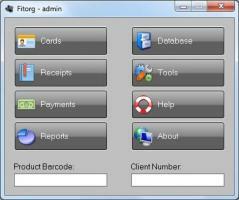 The program lets you easily control your club and manage the customers as well as their visits, automating your work. It’s one of the most effortless and effective ways of managing sales and payments. The first time you run Fitorg log in with username „admin” and password „admin”. You can change them later from the program’s settings.